I’ve heard about Bento-style lunches for years and, thanks to adorable images on Pinterest and a desire to eat better spurred by watching Food Inc., I’m wanting to jump on the bandwagon. My stepdaughter, Emma, has to bring lunch every single day, so packing hers is nothing new. Coming up with ideas is somewhat of a challenge, so I’m hoping this will help. My other three kids – Jaiden, Jaylen & Jenna – have the option of buying lunch or bringing it (they go to a public school; Emma does not). That’s all fine and good, it saves me time, but is saving time really worth it? School lunch is now $1.75 times three, so $26.25 per week, and the food is not really worth it: it’s not really healthy for them and, let’s get real, it’s not very tasty most times. So I think this year all four will bring lunch and the three in public school will have the option to buy when they really like something on the menu. Today I bought groceries, including some divided Ziploc containers and cookie cutters. I will have to build up to the real deal since summer childcare is, literally, 3/4 of my paycheck (seriously). But! I just made Em the cutest little lunch for tomorrow, which is pictured above. 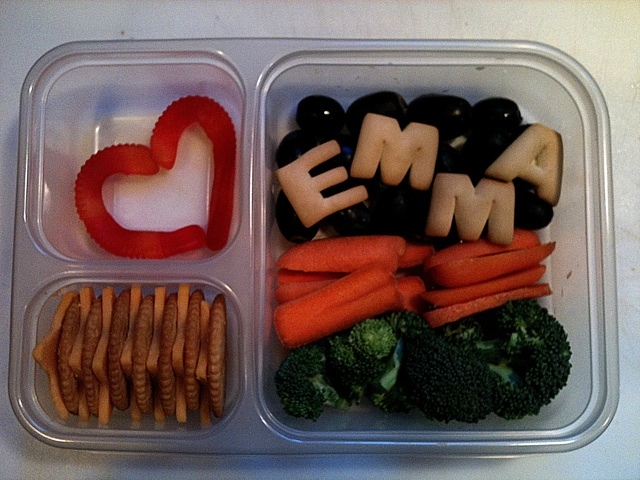 My first almost-a-bento is Ritz crackers and star-shaped cheddar cheese, broccoli, carrots, black seedless grapes, a gummy worm kiss/heart and animal cracker style cookies that are letters and numbers (we just have letters and they, obviously, spell her name). Adorable! 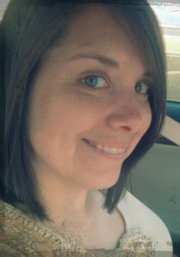 Echo is a 30-something single mom, news editor and student who lives with her children in Tipton County, Tennessee. Follow along with her 11-year blog at http://www.echoleigh.com. Those are adorable! Great first job! What a savings! Beautiful, simple, and I bet she loved it! I'm Echo, a mom of four from Tennessee. In keeping with my ambitious nature, this year I've decided not only to pack lunch for four children, but to bento these lunches. Follow along as we figure this out! Follow my Get Bento board on Pinterest for all kinds of ideas.